In this new slot game, Novomatic have gone overboard with the graphics! Just like how pirates used to send their enemies – by making them walk the plank. Novomatic have come a long way since they started making casino games and slot machines, over two decades ago! Now, Novomatic are known in many countries around the world for making really fun and high-paying online slots. Captain’s Booty is a rare slot game from this developer as it’s so graphically advanced. When you get a particularly big win, for example, a video is shown where you can see the pirate ship sailing away to the treasure. And there’s a lot of treasure to be won in this slot. Although this is a pretty different slot by Novomatic standards, it does have a lot of elements which give away the identity of the developer! The paytable is distinctly Novomatic, and so is the gamble game. You can turn the auto feature on or off, whenever you want. As is standard for this game vendor, the auto feature is very simple. When it’s on, it simply spins the reels for you until you turn it off. Captain’s Booty is all about finding treasure amongst the company of some scary, mutinous pirates! This online slot has 3 reels and 5 paylines. Ahoy there! Calling all brigands! You should also play these Novomatic slot games: Lucky Lady's Sharm Deluxe, Sea Sirens, Red Lady, River Queen, Sea Sirens, Age of Privateers and Sharky. Captain’s Booty is a good game to play, even for beginners. The design and the graphics are modern and sophisticated, but the rules are pretty simple. All pirates are searching for treasure. Most pirates have a treasure map to help them, but you have the reels and the symbols! Spin the reels to reveal new symbols. There are 8 symbols in all and they will land at random depending on where the reels stop. 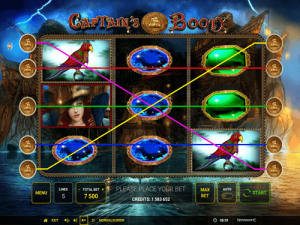 Unlike many other slots from Novomatic, Captain’s Booty only has 3 reels and each symbol only has one payout. The payout for an individual symbol will be paid when you get three of the same symbol to land on a payline (one on the correct position of each reel). To view how the paylines run across the reels, you can open the paytable. On there, it shows the paths the 5 paylines take across the reels. The paytable is also helpful by showing the payouts and the rules of the game. The payouts for the symbols that you can win will depend on your bet. The four gem symbols give the smallest payouts in the game. There is a sapphire, an emerald, a ruby and an orange diamond. The captain’s friend, Polly the parrot, and his trusty compass pay out wins that are double the size of the gem symbol wins. Bigger still are the payouts from the pirate’s pistols and the two pirates. Both of the pirates are female and the captain has lovely red hair! You can tell who she is by her golden hat. Captain’s Booty is a good game for beginners. The rules are simple and easy to follow and it doesn’t have any complicated bonus rounds or bonus games. Normally, good slot games for beginners tend to be quite boring! They are usually fruit games and don’t have very interesting graphics. This makes Captain’s Booty a great choice! Rather than just looking at lemons and grapes and watermelons, etc., you can see the open ocean and the pirate fortress behind the reels. The weather is quite rough and the lightning is lighting up the night sky! In front, at the pirate fortress, you can see the lanterns hanging off the rocks so that the pirate ship can find its way around the island and to the port. When you get a big win, for example if you fill all three reels with the same symbol, the game will show you the pirate ship sailing off into the distance! These sorts of touches really bring the theme alive and make this simple slot far from boring. Captain’s Booty is one of the most popular online slot games and you can play it for real money at many Novomatic casinos of wich you can read the reviews here at Novomaticcasino.co.uk. To play Novomatic slots for real money, you can make an account at a Novomatic casino. Different casinos offer their own games and unique bonuses. We have reviewed the top Novomatic casinos and you can read our professional reviews online. If you want to sign up, you can click on the link and claim the exclusive Welcome Bonus!